The last PPC campaign I analysed in the ‘Analyse A Real PPC Campaign’ was from YorkTest, who had an example of a PPC campaign that was too vaguely targeted, which would result in YorkTest both paying too much per click when they do get a click, as well as attracting traffic that might not be targeted enough to gain a good conversion for a healthy return of investment. With it being the start of December, something that the vast majority of people will be looking to buy is an advent calendar, in the run up to Christmas be it for themselves or someone else. With this, here is an analysis of a PPC campaign from Lindt. 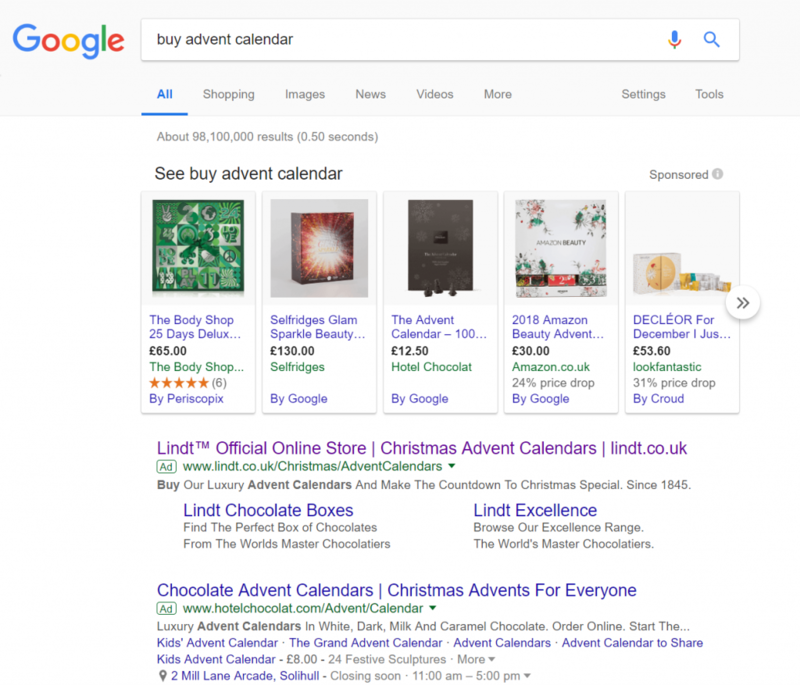 Lindt are having to compete, not only against other PPC campaigns but, Google shopping sponsored results. In order to compete, generally PPC adverts will need to differentiate themselves more, with ad extensions, for example- Lindt have done this through adding the site link extension. This increases the size of the advert, whilst increasing the number of links the web user can click onto to. All of this will result in a better click through late for the advert. It is also clear Lindt is a luxury chocolate brand. They have used this to their advantage, by having a very high brand name density throughout the whole advert. As a landing page goes, this is an example of a click through landing page, although not the best. This is because the areas to click (bottom left and right of the landing page), are not obviously links at a glance. 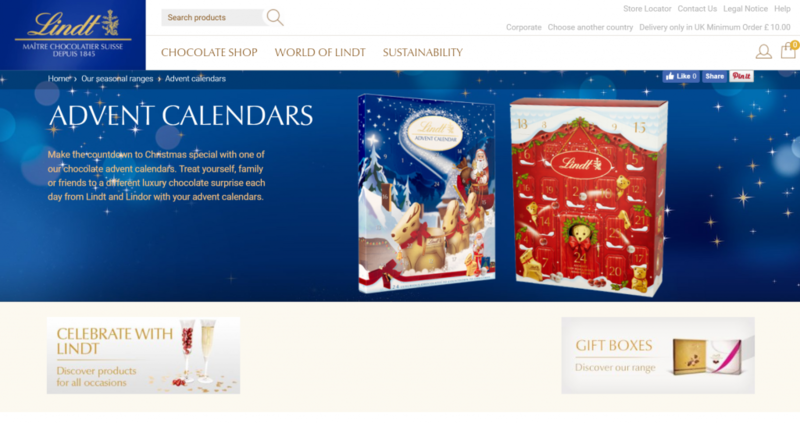 However, more worryingly, they push the web user to areas of Lindt’s website which do not relate to advent calendars. With this in mind, it would have automatically made this page better to have made the central image a link and to remove the two below image links. Putting this side, the design is nice and has a Christmas feel to it, which of course is important. It would have been good to see the range of advent calendars Lindt have on offer, so that it is immediately apparent to the web user that they have a choice other than the two that are shown in the image. As well as this, the use of social media buttons are a great way to add exposure to a landing page. However, when the Facebook ‘Like’ button has zero likes, it does not send across the best message to the web user – for landing pages such as this, social media buttons are a great addition. But, only add numbers to the buttons if they show off the page as very popular.